There are certain important aspects of learning an instrument which must be seen to be understood. Incorrect technical habits severely limit speed, accuracy, and tone quality. Our specialized pick technique study, will give you the skills necessary to become a good player quickly. 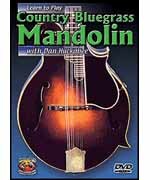 Includes: all the details of right-hand and left-hand technique, hammer-ons, pull-offs, finger exercises, rhythm strumming, chopping, proper method for changing strings, using the cassette recorder as a learning aid, tuning, & much more. Red Haired Boy, Fire On The Mountain, Old Joe Clark, Bill Cheatham, Goldrush, Sugarfoot Rag, Road To Columbus Video and Book course Beginning � Intermediate -------------------------------------------------------------------------------- About Dan Huckabee Dan Huckabee, has a degree in Music from The University of North Texas. He won the National Dobro Championship, & has played with The Allman Brothers, Lyle Lovette, Nancy Griffith, & Robert Earl Keen Jr, just to name a few. Dan founded Musician's Worskhop in 1973, teaches Guitar, Dobro, Mandolin, & Harmony Singing at The University of Texas Informal Classes, has taught workshops & seminars at festivals all over the United States, & has authored over 250 music instructional products. So get comfortable & let Dan's lifetime of musical experience guide you through everything you need to know in the quickest & easiest way possible!